The very words Mt. Everest evoke visions of heroism, glory and man"s relentless need to pit his mind and body against the best that mother nature has to offer. At 8850 meters Mt. 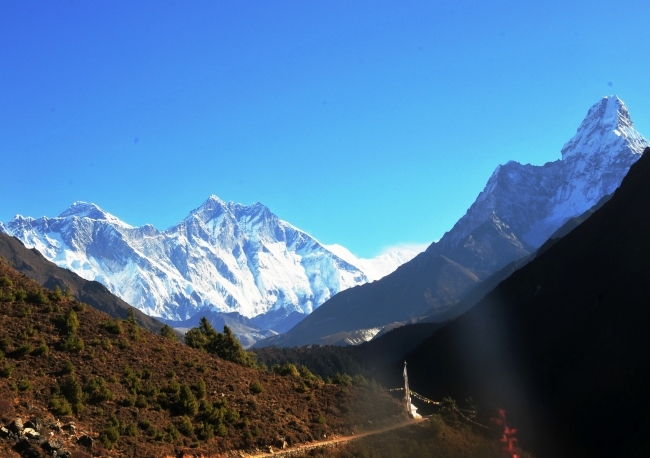 Everest is the highest point on earth and has been a magnet for adventurers seeking glory in its conquest. However, not everyone is inclined to glory and conquest. Some of us just want to get in close and enjoy the bounties that nature has bestowed on this earth and this is a good way to get almost as close as is possible to the tallest mountain in the world. The Sherpa (literally, "eastern people" in Tibetan) who largely inhabit the area migrated from Tibet some 450 years ago and settled in little valleys on the southern slopes of the Himalaya in the highlands of what is modern day eastern Nepal. Although fertile, compared to the arid Tibetan landscape that they had abandoned, life was by no means easy in their new homeland. The area was characterized by an outward migrating and dwindling population. To preserve landholdings and avoid fragmentation, a system of polyandry was practiced whereby a woman would marry all the brothers in one family. The arrival of the potato from South America via British India"s Sikkim about 150 years ago changed all that. The potato adapted well to the climate and soil and was high in nutrition values. The population expanded, trade flourished and monasteries and lamaseries were built to commemorate the good fortune and cultural as well as religious growth was possible. As you travel through the Khumbu region take time to visit some of these monasteries which have become icons of Tibetan Buddhism in their own right. Of particular importance are the monasteries at Thyangboche, Thame, Dingboche and Pangboche, but there are countless others scattered all over the country side which could warrant a mention. This trek is an all-time classic and should be very high on every trekkers "must do" list. This 15 days trek begins with an "eye opening" flight to Lukla at 2860 meters. The trek passes through the picturesque Sherpa village of Namche Bazaar to Gorak Shep culminating in the "ascent" of Kala Pattar (5500 m) from where classic views of Everest and its surrounding peaks are available. Most of the trek is spent above altitudes of 3000 meters in the Khumbu and Imja valleys whose skylines are dominated by the massive peaks of the Eastern Himalaya. Beautiful, multi-hued prayer flags, prayer wheels and intricately-carved mani stones line every hilltop, rock wall and trail side singing prayers to the gods with every breeze and every passing traveler. Day 02 In Kathmandu. Last minute preparations for your trek or if you are sufficiently prepared then sightseeing of Patan Durbar Square, Swayambhunath and Bodhnath. Day 03 Transfer to airport, fly to Lukla (2860 m.), trek to Phakding. Day 07 Trek to Thyangboche (3867 m.). Day 10 Trek to Lobuche (4960 m.). Day 11 Trek to Gorakshep (5164 m.). Day 13 Trek to Pheriche (4371 m.). Day 14 Trek to Thyangboche. Day 17 Fly back to Kathmandu, transfer to Hotel. Depending on your arrival time, further sightseeing is possible. Day 18 Spare day in Kathmandu to allow for domestic flight delays. Day 19 At an appointed time, transfer to airport for your departure from Nepal.